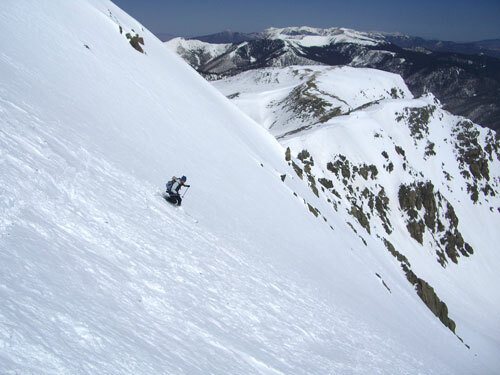 "Backcountry Skiing the High Peaks of New Mexico and Colorado"
The combination of climbing peaks and skiing is a marriage made in heaven. Under a blanket of white, the majesty of the mountains is amplified. 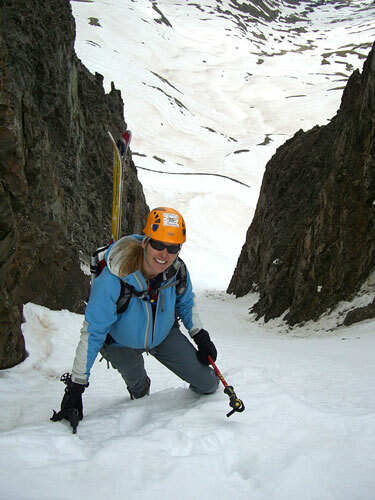 Even better yet, the tediousness of dealing with downed logs, talus fields, and scree-filled gullies is replaced by pleasant skinning through forests and snow climbing up aesthetic couloirs. Best of all is the exhilarating ski descent that has you back to your car and cold beer in no time. Indeed, there are no better travel tools for snow-covered mountains than two 5 foot long wooden planks with sharp metal edges strapped to your feet! In this slideshow, Amy and Scott will use the backdrop of their backcountry peak ski descents both to provide an educational angle on what it takes to go from being a proficient inbounds resort skier to a backcountry skier (including brief discussions of equipment and avalanche concerns) and to show examples of the fantastic backcountry skiing amidst high peaks that we have right in our own backyard of New Mexico and Colorado.